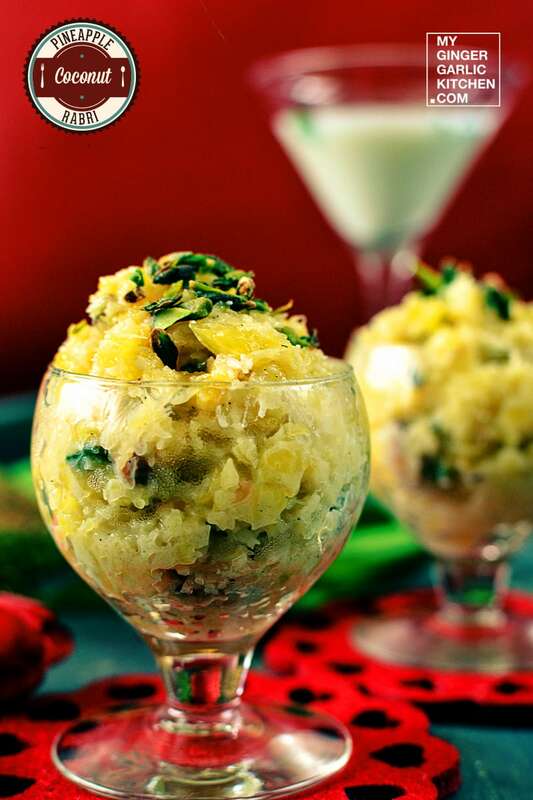 Pineapple Coconut Rabri is an Indian style dessert, and a totally awesome one. 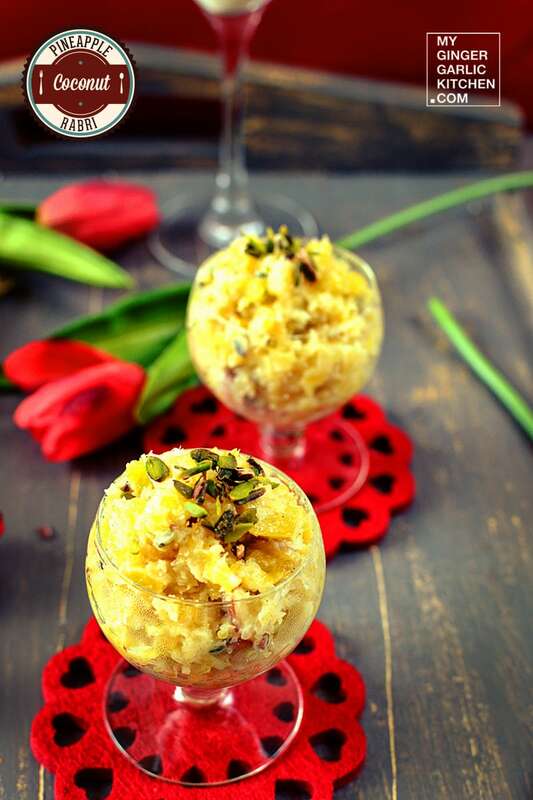 This exotic sweet dish has a unique fruity-juicy pineapple flavor which shines this authentic dessert Rabri. 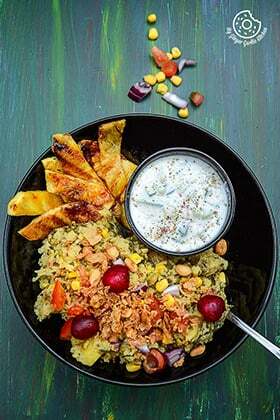 And coconut adds a nice nutty texture to this. 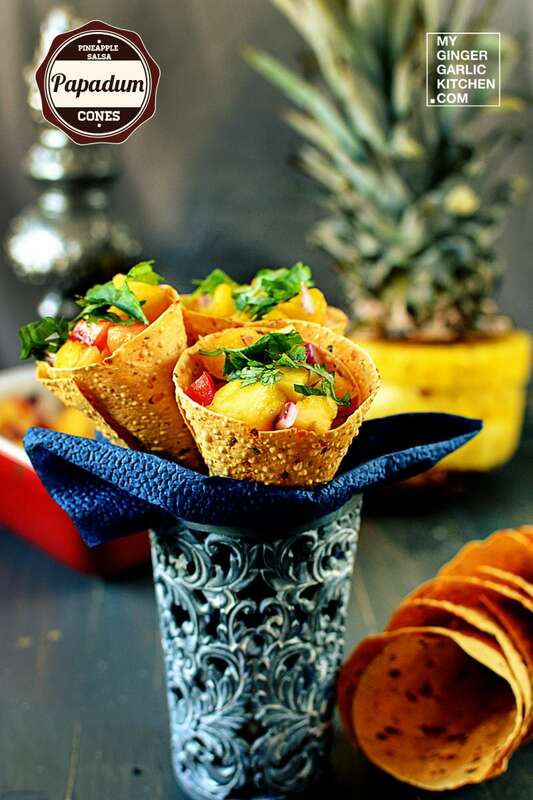 This is definitely a must try recipe for pineapple and coconut lovers. What is Pineapple Coconut Rabri? 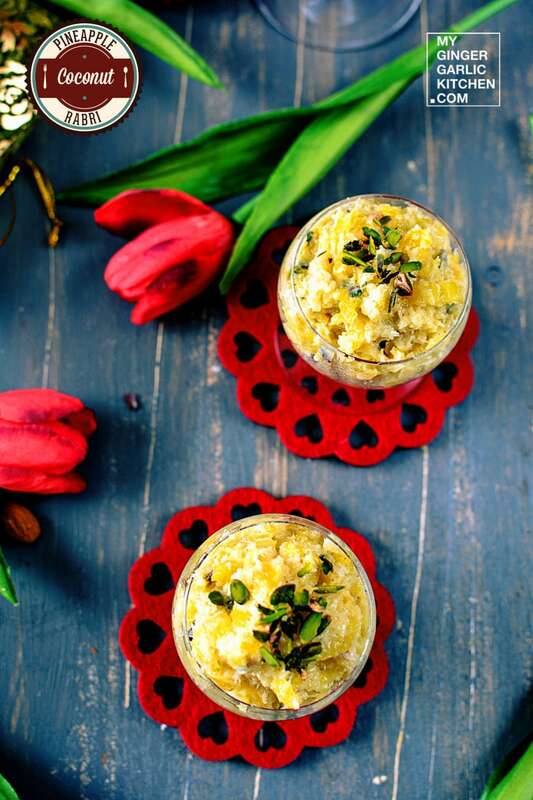 Pineapple Coconut Rabri is a classi twist to Indian Dessert Rabri. This Rabri is an Indian style dessert, and a totally awesome one. Traditionally rabri is prepared by evaporating full cream milk to half, but I am using evaporated milk for a quicker version. This delicious Rabri has a unique fruity-juicy flavor, and adding coconut gives it a nice raw touch. 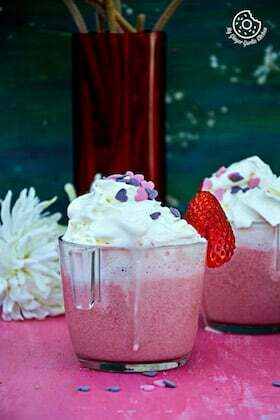 This dessert is quite simple and it can be prepared in less than 15 minutes. Let’s learn to cook Pineapple Coconut Rabri in easy to understand quick steps. Heat a pan. Add chopped pineapple, and sugar to it. Let them cook till water evaporates. Reduce the heat. Add condensed milk, evaporated milk, desiccated coconut, cardamom powder, and chopped pistachio. Mix well and cook for 3 minutes. Remove from heat, and let it cool completely. Keep in refrigerator for 4-5 hours. 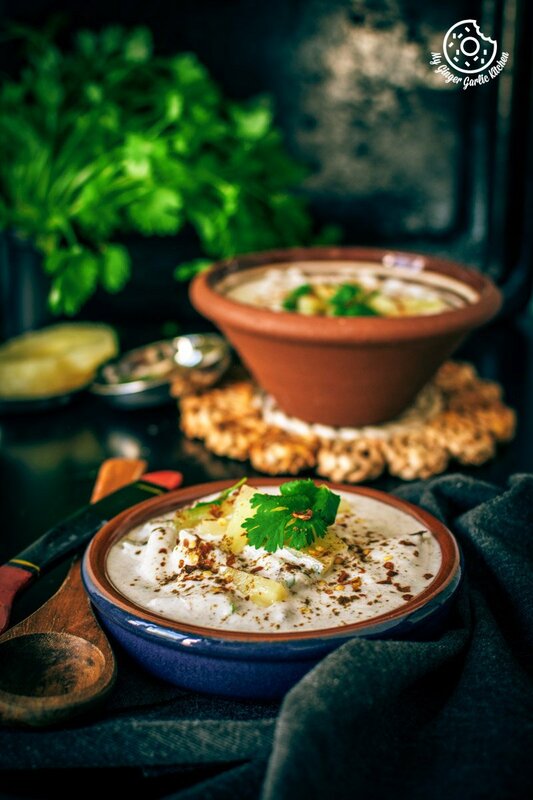 Transfer chilled rabri into serving glasses, and top with some chopped pistachio. Enjoy! Heat a pan. 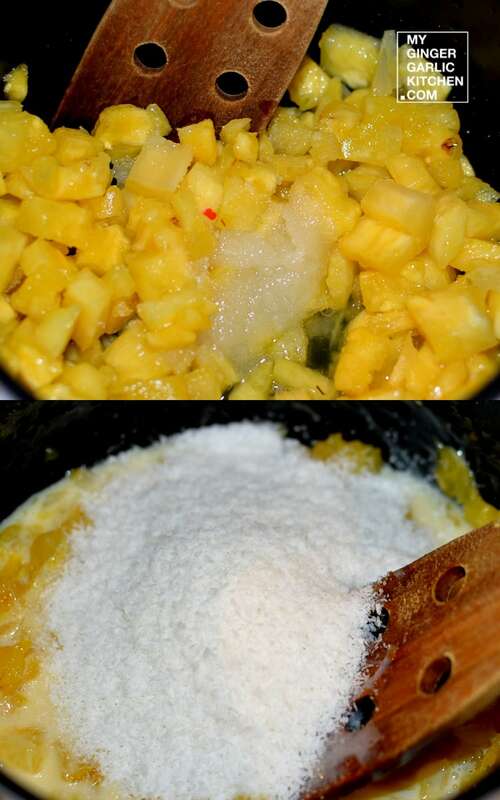 Add chopped pineapple, and sugar to it. Let them cook till water evaporates. Reduce the heat. Add condensed milk, evaporated milk, desiccated coconut, cardamom powder, and chopped pistachio. Mix well and cook for 3 minutes. Remove from heat, and let it cool completely. Keep in refrigerator for 4-5 hours.